This project used mapping techniques to identify the enablers and barriers that occur at the transition points during the emergence of a new industry. It utilised lessons from past industry emergence examples to develop guidelines for organisations seeking to create and capture value from emerging, technology-based industries. While basic science represents a valuable source of new ideas and opportunities, it can often take decades before this science finally finds application in the market, providing commercial value. Although various studies have explored aspects of industrial evolution (e.g. innovation, internationalisation, new product introduction, technological lifecycles and emerging technologies), few focus on technology-based industrial emergence. Many studies assume that an industry already exists, providing little information on the early stages of development (McGahan et al., 2004). This research brought an improved understanding of the characteristics and dynamics of this phenomenon, combining perspectives from a range of disparate disciplines (Malerba, 2007). 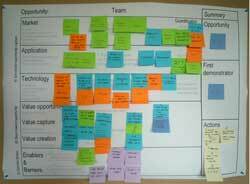 The project used established roadmapping-based approaches (Phaal et al. 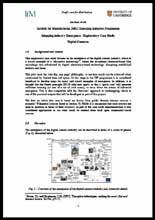 2001, 2003) to map the journeys and characteristics of technology-based industrial emergence. Through case studies, it used learning from past examples to develop guidelines and tools for organisations seeking to create and capture value from emerging, technology-based industries. Published work from several disciplines – evolutionary theory, social construction of technology, complexity science, industrial dynamics and technology management – was reviewed in conjunction with case studies to identify emergence dynamics. Integration of different perspectives continued into the development of pragmatic tools, building on technology roadmapping approaches. This integrated approach aimed to assist cross-functional communication, applicable at multiple levels (e.g. product, firm, sector). A framework has been developed which identifies phases and transitions of industrial emergence, together with events, milestones, enablers and barriers that characterise this process. A full lifecycle perspective is included, emphasizing early-stage phases associated with scientific and technological developments. Key transitions between phases are highlighted, when scientific knowledge is converted into technological capability and application. 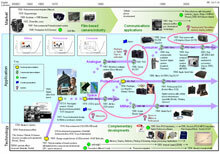 Roadmapping concepts are used to map industrial emergence phenomena from various perspectives. These cover value creation and capture activities, together with demand and supply side factors. Over 40 industrial quick-scan pilot maps have been created, allowing identification of common characteristics of industrial emergence, together with important dimensions and a focus on a chain of demonstrators that delineate the various phases and transitions. From this work, industrial emergence can be described as a co-evolutionary process in which nonlinear dynamics operate. It is sensitive to both the initial availability of resources and market applications. Growth is dependent on the supply-demand coupling, agents’ actions to reduce uncertainty and catalytic events. The preliminary framework and observations on the dynamics have been published in conference proceedings (Phaal et al, 2009; Ford et al, 2010). The detailed framework has been published in Technological Forecasting and Social Change (Phaal et al, 2011). The framework provides a basis for developing practical approaches (tools) for managers and funding agencies, supporting both the development and appraisal of strategic initiatives. 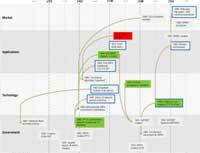 A roadmapping-based method for mapping, understanding and communicating historical industrial emergence, supporting policy, strategy and innovation processes, decision-making and action. Purpose: To help organisations visualise and understand the broad and detailed dynamics of industrial evolution relevant to their specific context. Learning from this provides a basis for improved processes for guiding and managing future emergence. Rapid iteration is efficient, and enables areas of particular interest to be identified for further analysis and mapping. An interview-based mapping tool that allows the insights and experience of individuals to be captured in a visual form. Analysing sets of maps that focus on the same organisation or industry provides the investigators with an opportunity to learn about the patterns and processes that have led to their emergence and evolution. 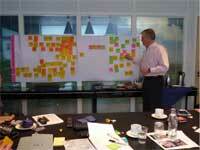 Purpose: To facilitate the creation of a historical visual map of the emergence of an organisation or industry. The map is a summary of the participant’s perspective of the key events and activities that have enabled or hindered this emergence. A workshop-based method for mapping, understanding and communicating a specific strand of an organisation’s emergence, to assist with an existing challenge, by providing information for decisions based on lessons learned. Purpose: To help organisations to understand how key lessons learned in the past: how they navigated barriers to emergence previously, or created opportunities: may be applied to the future. To provide a efficient communication mechanism so that different perspectives within the organisation can ‘start from the same page’ for future discussions. 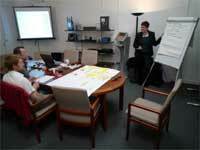 A workshop roadmapping approach, adapted to support organisations to navigate science and technology based industrial emergence. Multifunctional workshops enable priority steps to be identified through focussing on a demonstrator chain to commercialisation. Purpose: To help organisations identify, prioritise and explore demonstration-based opportunities associated with science and technology based innovation.